What's the Difference Between the Ford Escape & Ford Edge? The 2017 Ford Escape and the 2017 Ford Edge are two outstanding models, each offering their own set of perks and benefits. While they're designed similarly and include some of the same features, at the end of the day, these are two completely different SUVs. If you're wondering about the differences between the 2017 Ford Escape and the 2017 Ford Edge, allow the team at our Ford dealership in Apopka, FL, to explain. The main difference between the Escape and the Edge is in size, as the Escape is a compact SUV while the Ford Edge is midsized. The difference is clear when you take a look at the specs for each model. The 2017 Ford Escape offers 98.7 cubic feet of passenger space while the 2017 Ford Edge offers 113.9 cubic feet. In turn, the Edge also has much more leg room for rear-seat passengers -- there's more than a three-inch difference. The Edge also has more cargo space, with 73.4 cubic feet behind the first row. Drivers with a family might prefer the Edge, while the Escape is ideal for drivers who frequently travel solo. As a result of the size difference, the Ford Escape has a lower price point, with a starting price of just $23,750. However, the Escape only offers three trims, while the Edge offers four. The Escape begins the lineup with the S as the base model, while the Edge starts with the SE and includes a Sport trim. There Escape does not offer a sport-focused model. Both the Ford Edge and Ford Escape offer a host of safety technologies, including a Lane-Keeping System, Adaptive Cruise Control, Forward Collision Warning with Brake Support and BLIS® with Cross-Traffic Alert, which all help you avoid accidents on the road. The Ford Edge also offers a Front 180-Degree Camera with Washer to give you added confidence on the road. 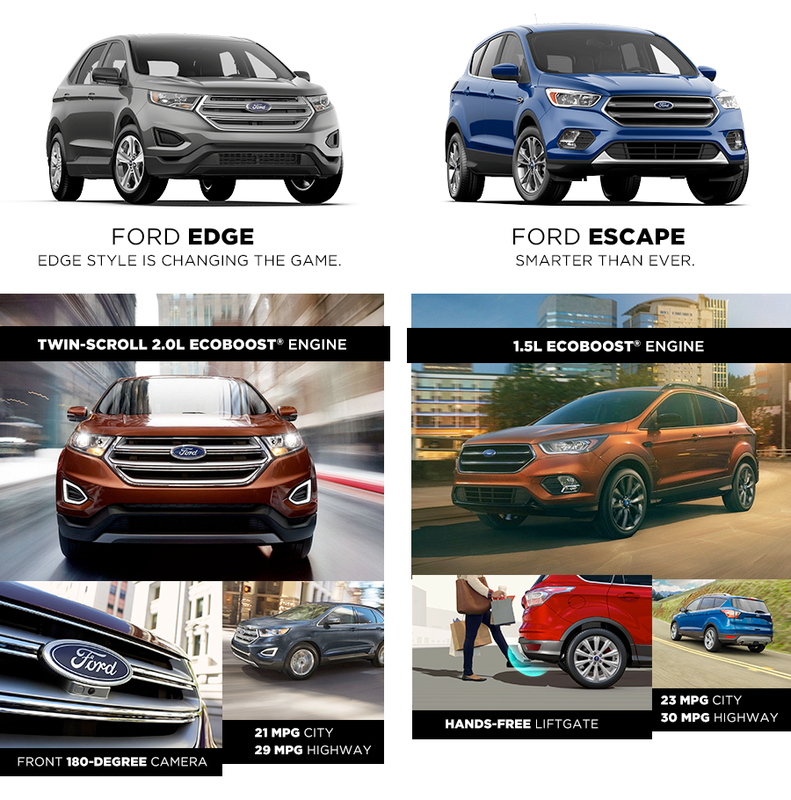 When you stack them up against each other, you can see there are clear differences between the new Ford Edge and the new Ford Escape. Take a look at our comparison chart below to see where each vehicle's strengths lie, and then come test-drive your favorite at our Central Florida Ford dealership.